Oh, The Avengers, what have you wrought? Anyone who's even come close to entertainment in the past decade or so knows that superheroes are everywhere -- On the big screen, on television, in video games, on T-shirts, you name it. For much of that time, these stories featured one superhero, or perhaps two if it was something like Batman with Robin. But, that all changed in 2012 when The Avengers hit theaters and showed the world what it was like when a superhero team took center stage. Now, superhero teams are all the rage. Not only do we have a second film -- The Avengers: Age of Ultron -- but DC has already set things in motion for a Justice League movie, and we're even getting Suicide Squad, which features a team of super villains. This obsession has spread to animated home video releases, as DC has already put out several direct-to-video movies featuring the Justice League. Now, DC is rolling out a new franchise with Batman Unlimited: Animal Instincts. As Batman Unlimited: Animal Instincts opens, Batman (voiced by Roger Craig Smith) is on patrol in Gotham City, when he comes across as robotic dog which is creating havoc. Meanwhile, Cheetah (voiced by Laura Bailey) and Killer Croc (voiced by John DiMaggio) hit a jewelry store, while Green Arrow (voiced by Chris Diamantopoulos) tries to stop Silverback (voiced by Keith Szarabajka) and Man-Bat, from robbing a bank. Things get even weirder when Bruce Wayne attends an event thrown by Oswald Cobblepot (voiced by Dana Snyder), and is surprised to see the robotic dog there -- An invention Dr. Kirk Langstrom (voiced by Phil LaMarr). Using his keen detective skills, Batman determines where this odd group is going to strike next and with the help of Red Robin (voiced by Yuri Lowenthal), Nightwing (voiced by Will Friedle), and The Flash (voiced by Charlie Schlatter) he attempts to foil it. It soon becomes clear that Cobblepot is the notorious Penguin and that he and his group of animal friends are up to something sinister. When we talk about an animated Batman movie, it's typically based on a comic book (as many of the recent DC Universe Blu-ray Discs have been). I suppose that it's possible that one could be based on a live-action theatrical film. 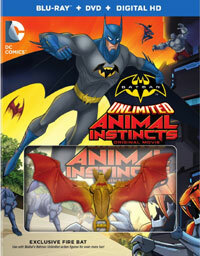 But, as far as I can tell, Batman Unlimited: Animal Instincts is based on a toy line from Mattel. We've seen things based on toys before (Transformers, GI Joe), and obviously the results can vary. But here we have an animated movie based on a toy which is based on a comic book. That seems like a long way to go to get to a fairly standard place. Given all of that, I wouldn't be surprised if viewers didn't have much confidence going into the movie. Well, here's a surprise, Batman Unlimited: Animal Instincts is pretty good. The movie works for several reasons. Knowing that it's based on a brand of toys, it's worth noting that everything is played very straight here. No, this isn't The Dark Knight, but the movie is fairly serious, especially when one considers that The Penguin plans to kill everyone in the city. There is also a sub-plot concerning Man-Bat which may be a bit strong for younger members of the audience. The good news is that we get a Batman who is serious, but not brooding or borderline insane, as we've gotten in other animated DC products. As evidenced by the synopsis, there is a good line-up of characters in the film which not only gives in to the recent trend of super-hero teams, but also gives us a much more detailed story, as it must serve several heroes and villains. (The story nice a nice job of focusing on each hero's strengths.) And it should be noted that this never feels like an advertisement for toys, save for a scene in which Batman dons a yellow costume. If I had any complaints about Batman Unlimited: Animal Instincts it would that the animation is a little lacking in detail and inspiration at times. It falls somewhere between traditional U.S. superhero animation and anime, and while it's serviceable, the animation alone won't draw (?!) you into this movie. My other complaint would be that while I liked the team approach, there isn't enough Batman here. Still, Batman Unlimited: Animal Instincts is a fun ride which presents some familiar characters, but doesn't require the viewer to have in-depth comic book knowledge to enjoy it. Batman Unlimited: Animal Instincts made me hungry every time Red Robin was mentioned on Blu-ray Disc courtesy of Warner Home Video. The film has been letterboxed at 1.78:1 and the Disc contains an AVC 1080p HD transfer which runs at an average of 18 Mbps. The image is very sharp and clear, showing no grain and no defects from the source materials. The colors look excellent, most notably reds and blues, and the image is never overly dark or bright. The level of detail is good, but this also shows off the somewhat limited nature of the animation. The Disc carries a DTS-HD Master Audio 5.1 track which runs at 48 kHz and an average of 4.0 Mbps. The track provides clear dialogue and sound effects. The stereo effects work well, most notably when sound moves from side-to-side. The surround sound effects really come to life during the action sequences, as do the subwoofer effects, which certainly liven up the fights. The Batman Unlimited: Animal Instincts Blu-ray Disc contains just a few extra features. "Penguin: High Society Criminal" (13 minutes) traces the history and personality of the villain through images from Batman comics and interviews with DC employees and experts. "DC Nation Shorts" offers ten animated shorts which feature Batman or animals. (The Batman of Shanghai shorts are pretty weird.) The Disc offers two episodes of Batman: The Brave and the Bold.